This year, as part of the 50th Anniversary celebrations, the University launched a Long Service Awards Scheme, to recognise the contribution of staff who have worked at the University for a significant period of time and have reached the key milestone of 25 or 40 years continuous service. A total of 240 staff from all aspects of university life with an amazing 7000 years of combined service were invited to attend a celebratory afternoon tea at the Apex City Quay Hotel. Mrs Heather Ferguson and Mr Ian Christie from the TORT Centre, were invited in recognition of their respective 38 and 26 years’ service. The event was hosted by the Principal, Professor Sir Pete Downes, and senior members of the University Management Team. All staff members invited were presented with a either a commemorative silver (25 years) or gold (40 years) lapel pin and £100 and £200 gift cards as a token of appreciation. Heather joined the university from the NHS in 1979. 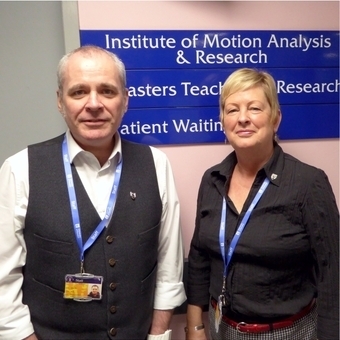 Originally in General Practice she moved to Dundee Royal Infirmary to assist the Departments of Urology in and Neurosurgery in 1983 under Mr Patrick Weaver and Mr Keith Baxby before moving to Ninewells Medical School to join the Faculty/College Office in 1996 under Professors Denis McDevitt and David Levison. She subsequently moved to the TORT Centre in 2010. Ian began his tenure in 1990 when he was enrolled as part of a European Social Fund 12-month course at the then School of Biomedical Engineering at the Fleming Gymnasium Building. After six months on the course he was asked to join the staff by the head of the department Dr Eric Abel, subsequently Professor. He then moved to the Department of Orthopaedic & Trauma Surgery at Dundee Royal Infirmary, under Professor David Rowley, before moving to the TORT Centre in 2000 under the guidance of Professor Rami Abboud. “I would like to personally congratulate each and every member of staff who has been recognised for their long service contributions. It is a great reflection upon their dedication and loyalty to the University as a whole … either that or they are absolutely mad (me included! )”, joked Professor Rami Abboud.